Its that time of year in Riverdale! The end of the school year. Time for beaches, barbecues, fun in the sun and... sharknados!?! 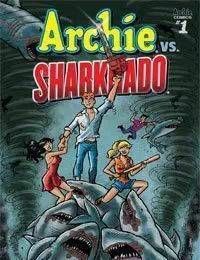 Thats right, get ready as Archie and the gang brave the storm of a tornado full a sharks that riffs off the pop culture phenomenon known as Sharknado! The story unfolds as sharknados are spotted on the Feast Coast! Our heroines have to figure out how to get back to Riverdale, where the storm is about to hit next. Soon Archie and the gang go, go, go as they battle the Sharknado-ravaged Riverdale! Who will live? Who will die? Will this take a bite out of the end-of-the-year prom? Uh... probably! The comic book action is also concurrent with the plot of Sharknado 3 and hits stands right before the films premiere in July on Syfy. Written by the Sharknado trilogy director Anthony C. Ferrante with Dan Parent.